Reclusive collector Cutter Merlin is seldom seen in Key West lately, not at all. Officer Liam Beckett visits Merlin’s curious house and discovers the gentleman in his study. In his death grip: a volume of occult lore and a reliquary. His eyes are wide with fright, his mouth a horrified rictus where spiders now dwell. Kelsey Donovan returns to the old house to catalog her estranged grandfather’s collection of artifacts and antiquities, vowing to see his treasures divested properly. But she cannot ignore the sense that she’s being watched, the reports of malevolent black figures, the pervasive smell of death. Is the Merlin house haunted, even cursed? Liam knows well that some ghost stories are true and he swears to protect Kelsey. But there are forces at work for whom one more life is a pittance to pay for their deepest desire. 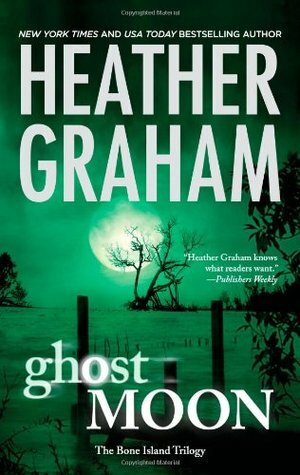 Ghost Moon by Heather Graham is full of spook. Chills, ghosts, and hauntings are found here. I was hooked. The mystery in this last part of the series was really evil. A man once known to a family ends up killing them all for a power in some object. But what he does not know is that the surviving member is friends with a cop who can also see and hear a ghost. A friendly ghost who helps the protagonists with their ongoing investigation. An old house full of creepy objects that would give anyone nightmares. Rumors of devil worship and black magic fill the pages. Only there is an evil human behind it all. And there’s another ghost wanting to destroy the human. The ending was bittersweet. I will miss Bartholomew. His personality and help were a major part of the attraction to this series. I cannot believe the series has finally come to an end…I loved all the protagonists and ghosts alike. Overall, I recommend this suspenseful yet dark read to all.